It is six months today since Sean died. That was a Sunday in autumn; this is a Sunday in spring, and the weather is beautiful. The leaves on the Norway maple were turning yellow then; now it has new green leaves. I visited Sean’s grave this morning: the grass is growing and will need be kept in check. His Munster rugby jersey on the grave is fading, but the Bob Marley t-shirt is holding up well. I had been to mass – singing in the choir for Palm Sunday – and I saw many of the neighbours and friends who were so good to us on 17 October and subsequently. It’s a great community. Three of Sean’s friends called to see us last Sunday – one of them, Mike, gave us a large, framed pencil drawing of Sean that he had done. I will not reproduce it here as that wouldn’t do it justice. It will always hang on our wall. It is beautiful, and it captures Sean very well. We are very grateful to Mike. It has been the strangest half-year of our lives. 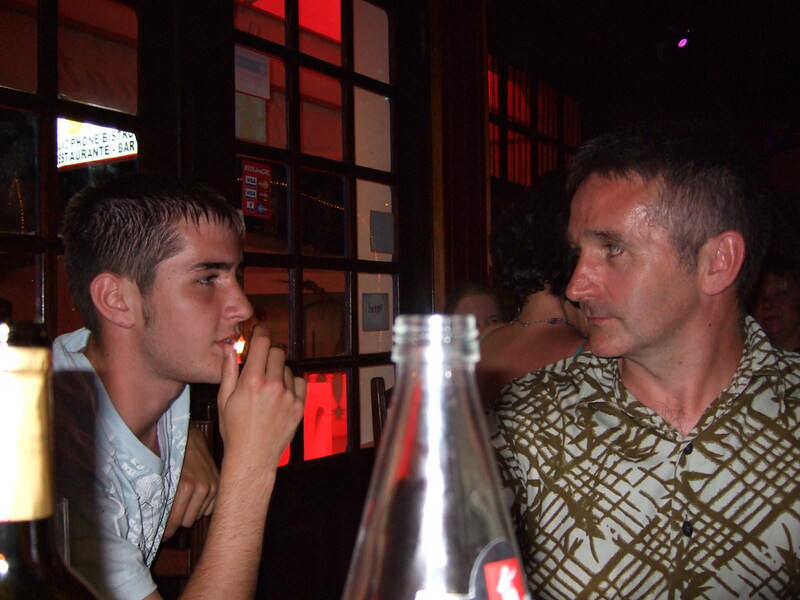 We have got on with things – work, school and socializing – but we think about Sean an awful lot, and miss him terribly. There is a tinge of sadness to everything. I am glad that technology has allowed me to create and maintain a kind of online scrapbook of Sean’s life, and ours, in the form of this blog. WordPress provides an excellent facility. I hope to continue to add to this blog as time goes on, in memory of Sean, as a resource for his family and friends and as an outlet for my own thoughts and feelings. Thanks to everybody that has made kind and supportive comments here. They have been very much appreciated. Hello Brendan, Pauline, Susanna and Chloe .. I have been thinking of you all today .. these anniversaries are so difficult .. time passing but love always remaining ..
Hello Marya … thanks very much for all your support and good wishes. I know you have had such anniversaries of your own. Do you like having your own blog now? You’re very kind, Brendan, thank you. ‘Happiness is beneficial for the body, but it is grief that develops the powers of the mind’. My best wish to your family on this day. Today has been a beautiful day here as well but nothing seems quite the same…it’s all shifted on an axis…Your ‘tinge of sadness’ so to speak. We are also grateful for the scrapbook you have made. We’re far away but it’s been wonderful to hear and see the things you’ve been writing and singing. We check in a few times a day as you know. I have read the words to your latest song but they are so emotional I don’t think I can listen to it yet. Maybe tomorrow if that’s ok.
That’s fine, AP. Thanks very much for this. It’s good to know that you look in regularly. Yes, emotional times. Everything has changed and nothing remains the same, as Bob Marley sang. Still, life goes on. I meant to say as well – you don’t need to put this on your blog but we’ve been thinking about you all day and send loads of love to you all. Also you, as a family, are setting a great example here Brendan. I’m very happy to know you, and sincerely wish to see you someday. Nice to see you here, Levent … thanks very much. Recently I have had reason to thank friends and family for their support, Brendan, and I can to a degree understand how you feel. Spring is about renewal and hope, but it is not quite the same when someone you love is missing. I’m pleased you have felt able to share your feelings about Sean here, and my best wishes to you and your family as always. Hello Araminta … it’s very nice to see you here, as always. I hope you and Bilby are enjoying your happy memories of your mother. It must be a very difficult time for you both. It is, Brendan, it’s all very strange, but we are adjusting. Thank you, it’s kind of you to think of us. Brendano. Yes, six months. I was deeply distraught when I heard about your son’s death. Do you remember those beautiful gold earrings I once spoke about on MyT? I posted a photograph of them, hooked into a great big tropical leaf. They were very special to me because my husband gave them to me for Christmas. We were not often together at that time. They were also special because they were quite simply beautiful. Intricate earrings, made to a traditional Martinique design, crafted by black goldsmiths. They are antiques. For some reason, my blog about these earrings was deleted, perhaps because I spoke of them as they are known in Martinique: ‘tété négresse’, negress breasts. You asked me to post the picture again, as you had decided to use them in a story you were writing. I did as you asked. Whenever I wore them, I always took them off carefully at night, and put them into a box. After learning about your son’s death, I went to bed, and just left them on the floor by my bed. The next morning, I got up and trod on one of them. The beautiful cone of workmanship was flattened and twisted. I put both earrings into the box, and shut the drawer, trying not to think about it. Nobody has asked me why I do not wear my Martinican earrings any more. Recently, I have been thinking about taking the damaged earring to a goldsmith, to see if it can be repaired, but it is hard because I cannot even open the drawer, let alone open the box and take out the damaged earring. All my love to you, as always. Hello Cymbeline … thanks for this. I remember the earrings … I used them in a novel I was writing, for which I haven’t yet got a publisher. The little story you have just told is a good one in itself. On the day Sean died, Pauline left in Lucca a necklace I had bought for her in Munich and earrings she had bought in Portugal, I think. On the day her father was buried, she lost a diamond from what had been his mother’s engagement ring. Beauty and mystery; damage and loss.